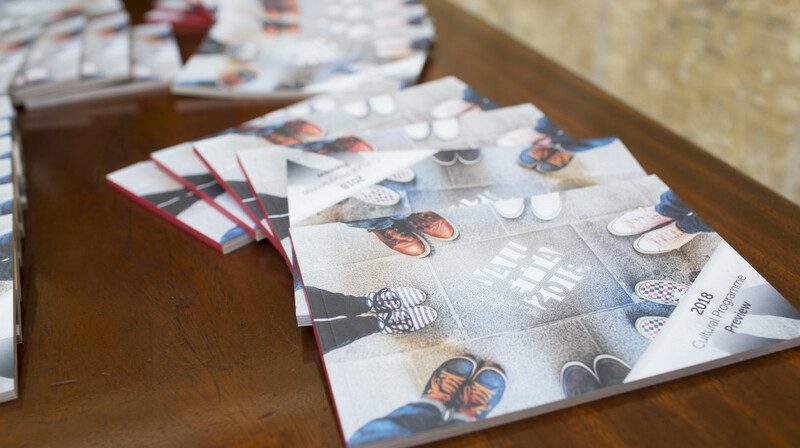 The publication of the Valletta 2018 Cultural Programme preview was launched earlier today. The preview of the Valletta 2018 Cultural Programme – a collection of artistic and cultural projects and events being planned for next year, was launched earlier today, at Palazzo De La Salle, Valletta. The publication contains general information on 2018 projects and events, offering the public a taste of what is to come. Valletta’s European Capital of Culture year opens on the 20th January 2018 with an official ceremony. As part of the opening festivities, various dynamic shows will be using Valletta’s open spaces, namely the Triton Fountain, Castille Square, St. John’s Square and St. George’s Square, as the backdrop for their performance. The Valletta 2018 Foundation has also implemented the concept of the festa in its programme’s narrative. Festi rely heavily on active participation of different people and likewise, the success of Valletta 2018 requires the collaboration of people from all walks of life, who contribute to the Valletta 2018 Cultural Programme. “The Valletta 2018 Cultural Programme is filled with innovative participatory cultural events, performances and projects, the likes of which have never been seen in Malta before. It is a great opportunity for people to come together and participate in arts and culture,” Programme Coordinator Margerita Pulè said. “Valletta as the Capital for Culture for 2018 is not the finish line but rather it’s another phase within the arts and cultural sector. Valletta 2018 project is in fact a long term project to preserve the cultural heritage and create a legacy that is enjoyed by locals and tourists alike to foster cultural heritage as a reflection of our identity as Maltese, Mediterranean and European”, said Minister for Justice, Culture and Local Government Owen Bonnici during today’s preview of the cultural programme for Valletta 2018. Minister Bonnici also emphasised that the work done was not only to safeguard the cultural heritage but also that of education and raising awareness in an important sector which can contribute to the economy, especially in the creation of jobs. Another highlight from the Valletta 2018 Cultural Programme includes Valletta 2018’s multi-site visual arts exhibition curated by internationally renowned curator Maren Richter. This main event is set to take place over the opening weekend, with its multi-site work branching out into several artistic pieces taking place in multiple venues all over the archipelago. The second edition of the Valletta Pageant of the Seas, the large-scale spectacle which transforms the Grand Harbour with nautical displays and fireworks will also be taking place in 2018 on the 7th June. An opera season is also being planned. This includes Aħna Refuġjati – an operatic work by young Maltese composer Mario Sammut that recounts the struggles of a family attempting to escape their war-torn country, as well as the Orfeo & Majnun opera which combines the Greek myth of Orfeo and Eurydice with the Middle Eastern legend of Leyla and Majnun. Other programme highlights include Altofest Malta, a Maltese edition of the Naples arts festival hosting interdisciplinary projects in diverse spaces, ranging from private homes to community venues and public locations. Malta Calls meanwhile offers an event comprising a set by international DJ Per QX, dances from ŻfinMalta and projections by London-based artists Shaun Prickemage and Dan Strutt.